What could be more elegant than toile crib bedding? This pattern originated in France and has been around for centuries, but continues to flourish to this day. Elegant and luxurious, toile baby bedding epitomizes the beautiful vigor of French artistry. And now with our many baby bedding sets in blue, black, and pink toile baby bedding you can find exactly the look and atmosphere that you have been searching for. 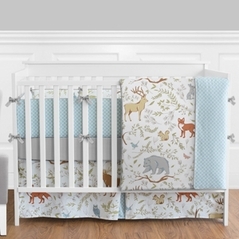 How about using toile crib bedding in a baby's nursery room! The distinctive toile fabric consists of �old world� subtle line drawings on a white or neutral background. 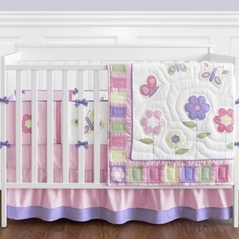 The effect is sophisticated, with a dreamy feel much like our celestial baby bedding designs. For those parents who are sick of the cliche baby bedding themes, toile baby bedding is perfect! Our toile bedding is now available in children's bedding sizes from crib and twin and all the way up to double and queen! We have several colors, including blue, red, sage, pink, and a very popular way to go is with a black toile crib bedding set! Made exclusively by Sweet Jojo Designs, our toile crib bedding is truly unique and will be perfect in any nursery. 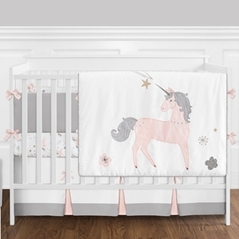 JoJo Designs also makes many matching accessories for all of our toile bedding sets, which will complete your nursery with the perfect room decor. If you love the chic look of toile, make sure you check out our line of bedding for your All Star in our sports baby bedding section or how about our ladybug crib bedding sets, all great ideas for your baby nursery!